The New Year has meant a lot of changes for me. It means I’ve come out of my first full year as a crohnie. And the year ahead means lots of hopefully good changes for me and my health. Last month I had my colonoscopy for my up coming Humira review. Despite everything came out clear and clean, the poylps they found suggested I could do much better with my diet in controlling my symptoms. 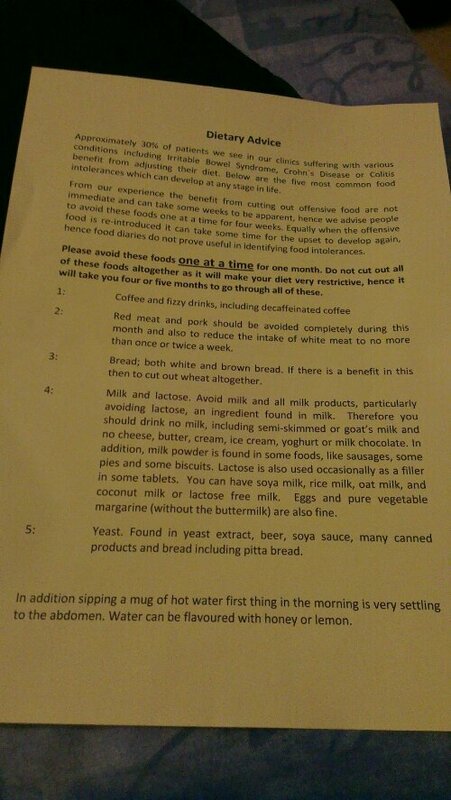 I was given – suprisingly and confusingly – dietary changes for IBS symptoms. I investigated: the IBS symtptoms that are common are also symtpomatic of IBD also – that’s logical because both affect the large bowel and thus the location of my crohns – and management of those symtoms should see me become more well. Not that I am unwell, for me, the niggly little effects I’ve have on a daily basis arent all that detrimental to my life on their own; but combined with my other irritations and problems they do indeed affect my life constantly. But I’ve gotten used to them. Now, however, it is time for a change. Alongside my reveiw, I’m on a new diet. As shown in the photo above, I’ve got to remove an element of my diet for one month and see how it affects my lifestyle, bowels and mood. This monthm: Fizzy drinks and caffeine. Not the most challenging one but certainly frustrating. I enjoy my coffee. I enjoy a cold refreshing can of Pepsi. I’m eight days in to this new regime and its not too bad until I go to work or have to go out. And this month, I’m full with meetings that happen in coffee shops or pubs. I am just abit screwed. But its for the good of my health, so I am sticking to it. It should be the easiest one to give up and modify my lifestyle for because it is not food related but it does mean I’ve stopped consciously drink as much, and thus eating as much. I now find myself really full after proper meals. I know the fight is just starting because I’ve got five whole months of changing my diet, and the elements that are coming up are more integral in my diet and thus harder to change, adapt and modify. But I shall keep you informed.